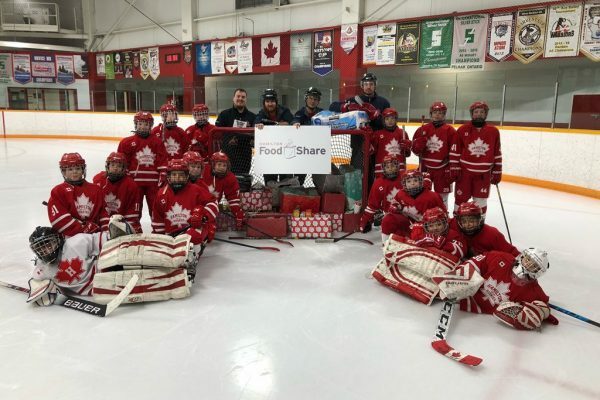 Hamilton Food Share provides a lot of food each year–2.7 million pounds. Over half of that is fresh or frozen. The food is only half the story of what Hamilton Food Share does. The other half is picking it up and delivering it. Having a reliable truck on the road is the lifeline to provide food to people using food banks in Hamilton. 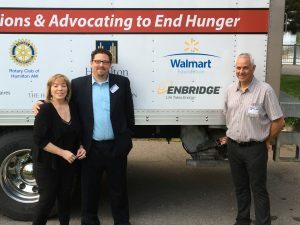 With support from ArcelorMittal Dofasco, the City of Hamilton, Enbridge, Food Banks Canada, the Harold E. Ballard Foundation, Rotary Club of Hamilton AM and the Walmart Foundation, a new large, refrigerated truck has been added to the Food Share fleet. Able to carry 30,000 pounds, the new truck increases capacity and makes it possible to pick up larger donations from food producers, retailers, distributors and farmers. 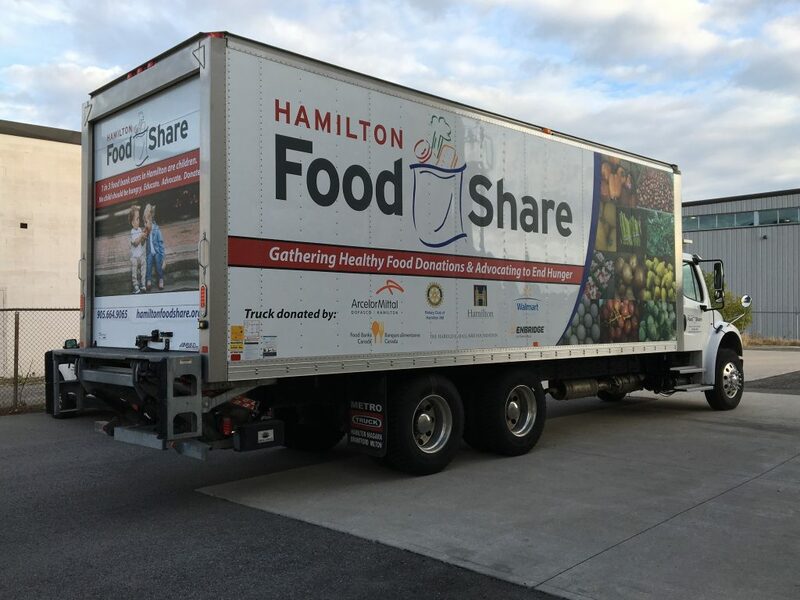 Hamilton Food Share’s new truck can carry 30,000 pounds of food. 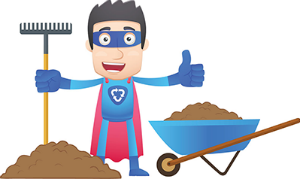 Thank you to ArcelorMittal Dofasco, the City of Hamilton, Enbridge, Food Banks Canada, the Harold E. Ballard Foundation, the Rotary Club of Hamilton AM and Walmart Foundation for their support in helping to feed more people in Hamilton. When a lot of people think about food bank supplies, they think food drives. In reality, food drives are the source of about 14% of food we receive. The majority of donations are perishables, and they’re coming from the food industry and farmers. Retailers and wholesalers may order more than can be sold. When the call comes from them, they are looking at having all the food they can’t sell taken away all at once. Our larger refrigerated truck increases the capacity to collect all that food for people in Hamilton. In the case of a local farmer, a bigger vehicle means making a single trip to the farm or orchard instead of two or three visits. That efficiency means that costs are kept low with more money available for food. 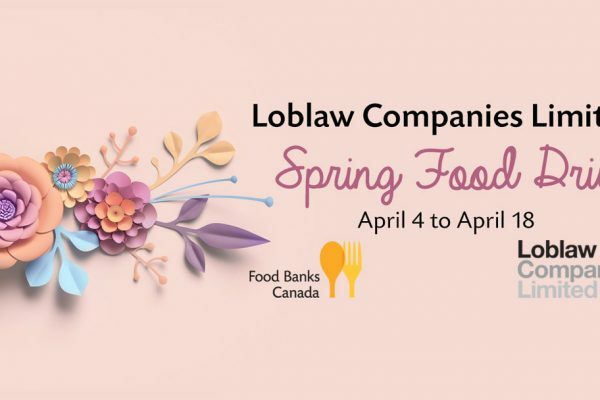 It also means that with fewer trips to the same donor, more time can be devoted to building relationships in the food industry to secure more donations for people in Hamilton. Our new truck replaces one built from used parts in 2002 and which was the backbone of our local food distribution network for over 15 years. 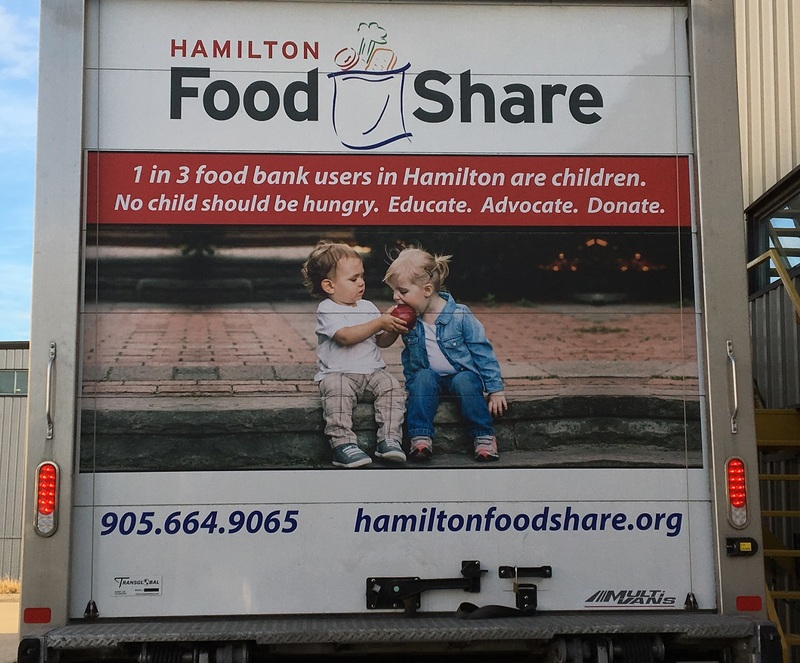 All donations for the new truck were over and above what Hamilton Food Share raises for food purchases. We are grateful for such outstanding generosity! 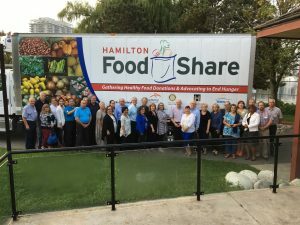 Members of the Rotary Club of Hamilton AM gather for a group picture with Hamilton Food Share’s new truck. Thank you to the Club for their support! 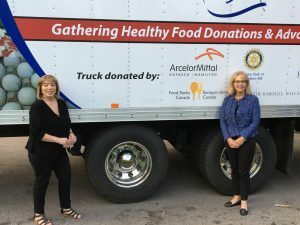 We’re grateful to ArcelorMittal Dofasco for their support in securing a new, larger truck. Here’s Joanne Santucci from Hamilton Food Share with Michele representing the company. Joanne thanks Herb and Kevin from Enbridge for their company’s support for our new truck. Thank you, Enbridge!